A toy box for upcoming Avengers 4 merchandise offers fans a look at two of the Marvel Cinematic Universe’s most iconic characters in a very strange set of white suits. Avengers: Infinity War, due to having so many characters in such a big story, had to place the heroes in sets of teams on their own missions around the galaxy. 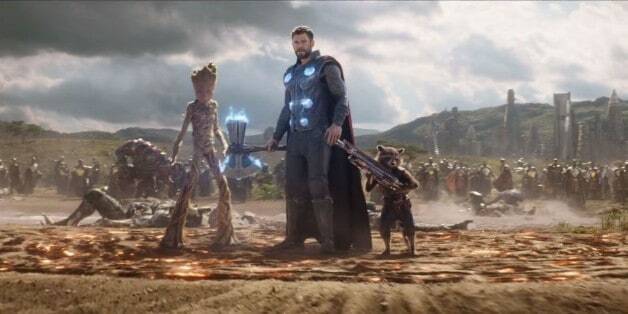 One of the fan-favorite team-ups from Infintiy War was Thor (Chirs Hemsworth) and Rocket (Bradley Cooper), as the duo, along with Groot (Vin Diesel), traveled to find a weapon strong enough to kill Thanos (Josh Brolin). If the latest promotional material from next year’s Avengers 4 is any indication, fans can look forward to seeing the duo team up once again. A new look at an Avengers 4 toy box has hit the internet and although it doesn’t reveal the film’s title, it does show off some strange new suits that Thor and Rocket will be wearing. The box features the duo wearing matching white suits that weren’t seen in the previous film, so we’ll probably have to wait until Marvel reveals more about Avengers 4 to learn about the context of the costumes. Check out the suits in the image below. The image also offers a look at various members of the team at the top of the box. The design of the art seems to match promo images that were revealed earlier this year, which means that fans may get more than just Thor and Rocket in new super suits. Even in the small image featuring Captain America (Chris Evans), you can catch a glimpse of the same white/red suit design that Thor and Rocket have. Considering how much of Infinity War Marvel was able to keep hidden from the public, despite Mark Ruffalo’s blurting out of the film’s ending a year prior to its release, it’s safe to say that fans will have to wait for Marvel’s official unveiling of Avengers 4 to truly understand what the latest MCU team up has in store for Earth’s Mightiest Heroes. We’ll be sure to keep you updated on all news regarding Avengers 4 as more information becomes available. Does the image above make you more excited for Avengers 4 or is it too much of a departure from the previous costumes? Let us know your thoughts in the comments below! Those are the space suits the avengers use in the comic infinity to travel through space and increase their strength and mobility. Most likely design by tony stark. Thor doesn’t need one, so that’s a bit weird. Its probably just another aesthetic choice to shallowly sell more toys and have no purpose.